The story of some of the greatest music performers and songwriters in American History. The “Baby Boomers” returning home to retire in San Angelo & Abilene are making it almost impossible for the WTMHOF to find a permanent building for the museum. With their retirement along with selling their homes in California they return home with big bucks in which they then get involved with local activities. Some of these activities include purchasing/renting buildings in prime areas in order for them or their wives to have something to do. This not only creates a shortage on choice historical buildings but also runs up the price. Sad to say the only thing Americans seem to relate to is…money. Eddy Arnold, Country Music Hall of Fame singer, died on May 9th 2008 just a few months shy of his 90th birthday. After receiving encouragement from friends and fans he recorded his 100th album just a couple of years ago. Before he decided to record this LP he responded to these folks by saying he didn’t know if he could sing any more? After singing in the shower practicing up he decided he sounded pretty good for his age. Eddy Arnold was extremely popular in the 40’s when country wasn’t cool. With first-rate pop-oriented material and a friendly smooth voice, much like Bing Crosby, he won approval from listeners around the world. For starters here are some examples: “I’ll Hold You In My Arms” #1 for 21 weeks staying on the charts 46 weeks. “Anytime” #1 for 9 weeks staying on the charts 39 weeks. “Bouquet Of Roses” #1 for 19 weeks staying on the charts for 54 weeks. It’s no wonder he’s the #1 singer in Country music history. One of his many fan favorites was “The Cattle Call” #1 in 1955 in which he later sang on Le Ann Rimes “Blue” LP. He was doing pretty well health-wise until he fell. Eddy invested his money wisely purchasing property around Nashville now worth millions. He’s survived by a son and a daughter. The West Texas Music Hall of Fame Annual Awards Thanks to our new web-designer, Dani Shaw from Garland (www.galiper.com), we are now able to pick up where we last left off in 2005…concerning annual recognition awards. We hope the recipients, who will be receiving these award plaques, will understand the delay. Since we’ve made every effort to contact the above recipients including sending them e-mails…if we fail to receive a response (needing an address) their award plaque will be put on hold. Jody & band continue to amaze as they travel all over West Texas week after week, month after month and year after year performing in clubs and for special events. Be sure and check-out http://www.jodynix.com and while you are there click on their Schedule. From Big Spring to Lubbock, San Angelo, Snyder, Midland, and then all the way to Amarillo and back to Big Spring then for good measure throwing in Wichita Falls and Ft. Worth? You would think that schedule would warrant a break for Jody possibly basking in the sun in Hawaii? Guess not, as he’s now scheduled to play in Washington, DC for almost a week. When you go to his site be sure and listen to the opening song before you click on “Enter” as bands work very hard making records and always appreciate you taking a listen. For some of you who don’t know…Jody is the son of Hoyle Nix (The West Texas Cowboys from Big Spring 50’s 60’s). Hoyle was not only a friend of Bob Wills but patterned his music after Bob & The Texas Playboys. Jodie & The Texas Cowboys continue carrying on the Bob & Hoyle tradition…out there preserving Western Swing. Jody Nix was the WTMHOF’s 2001 “Entertainer of the Year” and continues to perform at the Stampede in Big Spring…the club his dad made famous. At one time a young and inexperienced singer, named Lefty Frizzell, was across town at the Ace of Clubs on Highway 80 doing his thing. The discovery of oil, along with a refinery being in Big Spring, was a big factor in these two historical clubs attracting some big crowds. After finally “waking up” with only 2 minutes remaining on an e-Bay auction we jumped in bidding $100.00 in which other bidders had run it up to $46.00. After bidding $100.00 others came back the last 2 minutes trying to outbid me but time ran out on them. The final bid was $76.00 + shipping. The BH street sign is an original and had gotten broken during installation in which the city let one of the employees have it.. Had I bid $100.00 earlier most likely we would have been out-bid. Go to e-Bay searching #330234986386 if you might want to view it. If it had not been for the small crack (damage) we would never have gotten a shot at this one-of-a-kind piece of WT music history. West Texas History – Santaria Well In the early 1900’s Americans were moving west in wagons in search of land and opportunity that goes with free ownership. Sometime before the 19th century the Texas Legislature appropriated 2 million of acres of land covering parts of 20 West Texas counties for The University Of Texas. Many of these ranches were enormous in size but most were insignificant in value. After traveling 400 miles by wagon from Corsicana W. A. Ricker would be the first to lease land in Reagan County for oil exploration. In 1921 Frank Pickrell obtained the leasing rights from Ricker and The University Of Texas to drill a wildcat a stone’s throw of the Orient Railroad on the far Southwest corner of the county. On the very last day before the drilling permit was about to expire a well was spudded in. Since water is needed for drilling the very first well was actually a water well. A group of Catholic women had invested in the venture and had asked that the well be named Santa Rita (“Patron of the impossible) plus giving Frank Pickrell a small package containing dried rose petals, that had been blessed in the Saint’s name, asking him to christen the well. The location was surveyed by state licensed surveyor J. J. Goodfellow of San Angelo. The geologist was Hugh H. Tucker. The wooden rig was built by R. S. McDonald of Big Spring. Carl Cromwell from Cisco was the driller with the water drilling machine coming by rail from San Angelo on the Orient Express. After 22 months of drilling with a cable tool rig averaging 5 feet per day the crew noticed gas bubbles and oil on the bailer from the 3,050 feet depth. The rig was then shut down and Frank Pickrell was notified in New York by telegram as the workers took off trying to lease some of the surrounding land for themselves. A few days later on May 28, 1923, without anymore drilling, the San Angelo Standard reported the well had blown in at 6:00 AM. It was later learned that Santa Rita #1 was on the very edge of the oil pool with 107 wells eventually being drilled in two pay zones with University #1B producing from the deeper zone at 3000 barrels a day. Santa Rita #1 was the beginning of a new era for West Texas as oil exploration spread across the Permian basin making it one of the largest oil producing regions in the United States pumping huge amounts of money into the University of Texas system. In 1990, after 67 years of production, Santa Rita #1 pumping unit is now a commemorative on the campus of U.T. About the same time W.A. 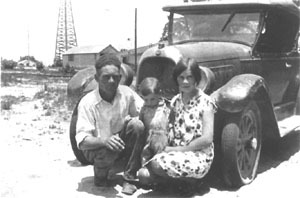 Ricker was leaving Corsicana heading for West Texas William Frizzell was moving his family to a farm near Corsicana at Tuckertown to get work in the newly discovered Powell oil field. Both William Frizzell and his son 15 year old Naamon worked in the oil field. In 1928 William Orville “Lefty” Frizzell was born to Naamon and A.D. Frizzell behind an oilrig in a house on the Pure Oil Company lease at Tuckertown. Lefty’s formative years were spent in El Dorado, Arkansas where his father continued working in the oil fields. When he got older Lefty worked with his father as a roustabout in the oil fields of Loco Hills in Artesia, New Mexico. It was his great dislike of this type of work that pushed him into a singing career. He quit his oil field job in Artesia in 1949 taking a playing job at The Ace Of Clubs in Big Spring, Texas. Big Spring was a West Texas town founded because of the T & P Railroad and oil having been discovered in the 1920’s. The Ace Of Club’s patrons along with Hoyle Nix & The West Texas Cowboys across town at Yales’s Inn were mostly workers from the Cosden Refinery in Big Spring. Forty miles west of Big Spring is Midland, Texas and prior to World War 1 Midland was a railroad town serving the surrounding ranch communities and was once called “Midway”. The future of Midland would change when on May 27th 1923 Santa Rita #1 blew in 70 miles southeast. Today Midland is a thriving community of 100,000 people and is sometimes referred to as “Little Dallas”. In 1937 Ernest Tubb visited Monahans winding up living in Midland working for Blatz Beer that included a radio show featuring The Blatz Western Melody Boys. 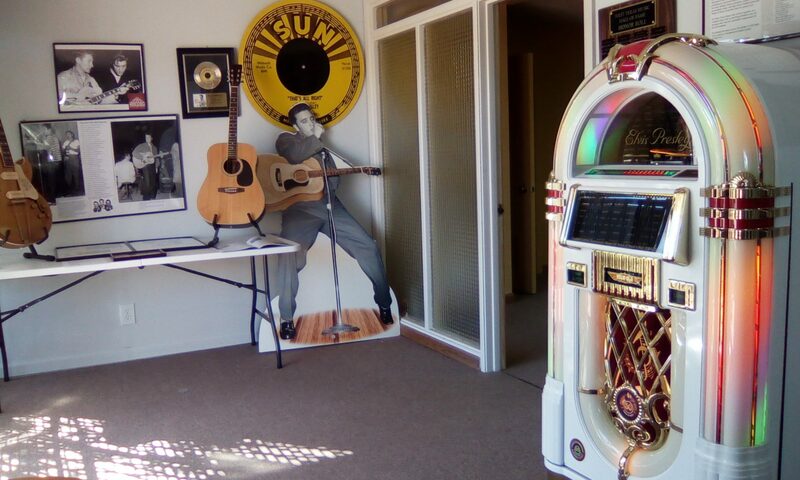 Roy Orbison’s family moved to Wink with his father working in the Winkler County oil fields. Like Lefty Frizzell, Roy became an oil field roustabout working for El Paso Natural Gas Company. Roy later majored in geology at Odessa Junior College. Oil fueled the economy of most West Texas towns attracting families that would not only produce black gold but gold records. Tanya and La Costa Tucker along with Larry Gatlin were born in the oil town of Seminole. Dan Seals born in the oil town of McCamey. Guy Clark was raised in the oil town of Monahans writing “Texas 1947”. Abilene, Texas was formed when a couple of local ranchers C. W. Merchant and John Merchant persuaded the Texas & Pacific Railroad to bypass Buffalo Gap bringing the line through their ranch lands that later became the township of Abilene, Texas. The first test well was drilled in 1892 near Abilene High School. Slim Willet wrote most of his songs about the oil patch that included the Snyder, Texas oil boom. Ranch pioneers Ira & Ann Yates (part of ranch later became Iraan, Texas) shallow well #3 discovery become the wonder of the world with a potential of producing 175 thousands barrels a day (not a misprint). In 1926 oil discoveries put the Panhandle on the map. By 1934 the world’s largest single producing gas field was in the Amarillo Mountains with refineries being built all across West Texas that included the Farmer’s refinery in Lubbock. 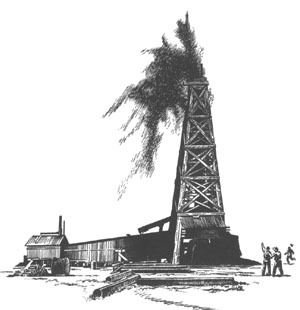 Note: The West Texas Music Hall Of Fame oil rig logo was taken from a photo of Santa Rita #1. The high price of crude oil has caused a boom in housing and business development in Midland (read early HISTORY on this site). Abilene has been on a tare for some years now having 5 foundations who have shared their kindness and money with many area non-profit organizations in order to preserve historic downtown. Behind this was the idea that historic Abilene, along with other local attractions, would rate high on the list of Texas tourist attractions. The high price of gas will surely throw cold water on that plan. Quite a few from the Honor Roll & Songwriter section have just up and disappeared? Yes, it’s true as time continues to march on no one can stay young forever. The highest per cent of folks now living in West Texas are in their middle 40’s. Since time is of the essence we have been doing everything we can in order to have a permanent WTMHOF-Museum building in Abilene. We won’t be depending on others as our motto has always been: “If you want something done you gotta do it yourself”. We visited the National Cowgirl Hall of Fame’s multimillion dollar facility ($8.00 person) located near the Will Rogers Coliseum on a Sunday afternoon in May. This all-new brick building is about ¾ of a block long and possibly 3 stories high with 33,000 sq ft. of space. Out front is a life-size bronze statue of a gal on a horse along with a large painted mural on the side of the building of 5 gals on horses. I was overwhelmed by the expensive door handles, glass cases, carpet, the interior, stair cases, railings etc. The place is a prime example of too many people with too much money spending it foolishly…the blind leading the blind. Instead of concentrating on the cowgirls and their memorabilia they put most of their efforts on trying to impress people. There were a few Roy & Dale items such as a lunch kit, a kid miniature guitar, a few historical cowgirl boots, chaps, saddles & hats that are displayed in high-dollar glass cases. All in all the National Cowgirl HOF is a joke when it comes to being a museum. If you want to see a list of the Hall of Fame inductees (you won’t find it on any wall) just ask one of the folks at the reception booth and they will hand you one on paper. Want to hear a song from the past by Dale Evans (Uvalde) or Louise Massey (Midland)? No problems as you can drop a quarter in miniature juke box putting on a pair of ear phones. This is one of those places, much like Frontier Texas, where you go one time never to return.